A variety of surface transportation funding mechanisms were debated during an all-day informational hearing held by the House of Representatives Transportation and Infrastructure Committee on Feb. 7, with a focus on the need to increase the federal fuel tax. 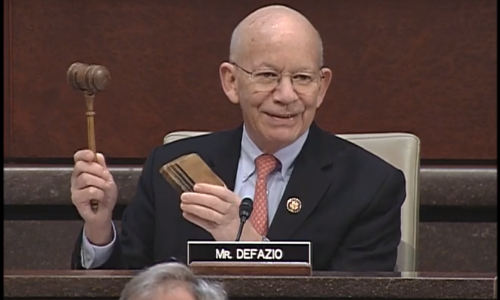 “For years we have held hearings documenting the deterioration of our infrastructure – now we’ve run up a $2 trillion funding gap,” explained Chairman Rep. Peter DeFazio, D-Ore., (seen above) during his opening remarks. “Federal fuel taxes have been stagnant since 1993; they now have only 40% percent of their former buying power, maybe less,” he stressed during the hearing, entitled The Cost of Doing Nothing: Why Investing in Our Nation’s Infrastructure Cannot Wait. Ray LaHood, co-chair of the Building America’s Future advocacy group and a former secretary of transportation during the Obama administration, suggested raising the federal fuel tax by 10 cents per gallon and then indexing it to inflation, but also combining that measure with other funding sources. Minnesota Governor Tim Walz (D) – testifying on behalf of the National Governors Association – added that state governors are “making infrastructure a top priority” this year. In other committee news, Rep. DeFazio and Rep. Rick Larson, D-Wash., introduced a bill on Feb. 8 that would shield Federal Aviation Administration programs and personnel from the impact of future Federal Government shutdowns. That bill – H.R. 1108, the Aviation Funding Stability Act of 2019 – would do two things. First, it would authorize the FAA to continue to draw from its Airport and Airway Trust Fund during shutdown as the AATF generates enough revenue from the domestic passenger ticket tax, commercial fuel tax, general aviation gasoline tax, and cargo tax, among other sources, to sustain all of the agency’s programs without a general fund contribution. And, second it would allow the entire agency to operate at current funding levels, with no Congressional action – ensures that all FAA programs function uninterrupted and that all FAA employees continue to be paid. “Allowing the FAA to draw from the AATF during a funding lapse will ensure essential personnel who work under immensely stressful situations continue to get paid, and that the largest, busiest and most complex airspace system in the world remains safe for passengers and employees,” said Rep. Larsen, who chairs the House Subcommittee on Aviation, in a statement.